Could it be? Is it possible? Have I found it? You’re probably wondering what I’m talking about and I’m excited to tell you that the subject of today is…voice. I’ve been writing a lot lately. I’ve given myself a deadline—hopefully a realistic one—and my plan, my hope is to achieve that goal. If I go with the what if, I’ll have to change quite a few things about my current story in hopes of creating the AHA. Should I? Do I dare? So yesterday I decided to give it a shot. I had so many ideas. I just had to get them on paper, or at least into a WORD document. I took a few notes and then I went for it. I wrote an opening scene and was surprised to see the words flying onto the page. I didn’t pause, I didn’t think. I envisioned the scene and wrote what I saw. When I was finished, I sat back and read it. I read it again and smiled. The feeling was unbelievable. I liked what I saw and I had a feeling others would too. I then sent it to Beth and Brenda. I had to. I needed to know if it was what I thought it was. Was it possible that everything had finally clicked and I’d found my voice? I hope so. But regardless of whether or not this is it, I’m happy I tried the what if. Now I've got to get back to writing. I've got deadlines! Have you found your voice? Your niche? Ever went with a what if? What happened? Please share your stories. A unique voice, whether it be a singer's, artist's or writer's voice, is most usually the thing that gives that person the edge over their peers. An editor or agent can read three manuscripts of equal quality, but if one of those has a special 'sound', something that sets it apart, that's the one he/she will be most excited about. I do think you found your 'voice', Barb. I would run with it--even if it means going back, starting over and setting a new deadline. This is huge. I loved what I read. Sing it loud and proud. La, la, la, la! Barb, I am so happy that you have found your voice. Keep up the momentum and you just might finish on your deadline. good luck and happy writing. Good Morning, Beth and BJ! Thank you much for the kind words. I'm going to work with this new idea again today and see where it takes me! Hey BJ, we're all dying to know...how's your book coming? 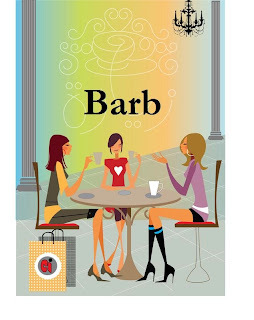 Barb, congrats on finding your voice! Voice is what makes the book stand out and/or what sells the ms to the editor in the first place. You go, girl! Thanks for the rally. Have you found your voice? How long did it take you? How did you know? Even though I've been writing for more years than I care to admit, I'm still not entirely sure I even know what voice IS, let alone whether I have it. You sound discouraged. Don't be. Do you enjoy writing? I know you do. Do you enjoy the people you've met during the process? I know you do. Are you excited about the next one? I KNOW YOU ARE! I'm not sure if I've found it either or the exact definition but I do know that everything I'm putting into this is making me a better, stronger person. That's part of the voice, in my opinion, finding yourself, learning, growing, imagining, escaping and having a blast while you're doing it! I have read your WIP from the beginning and have enjoyed every bit of it and eagerly awaited more. I've noticed your advances in writing as time goes on, and I believe that you have indeed found your voice. I am so proud of you and envy your dedication and persistence! Ride your wave! Sometimes I think I enjoy the planning and research a whole lot more than the actual writing. But then I'll suddenly have this movie running through my head that I have to get typed up ASAP. Thank you so much Bren. That means a lot to me. I have a long way to go but I'm enjoying the process of getting there. I know exactly what you mean about the movie running through your head. Those are by far the best writing days!